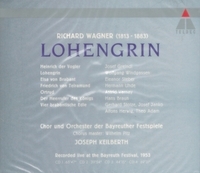 "This historic LOHENGRIN was recorded by Decca at Bayreuth in…1953. 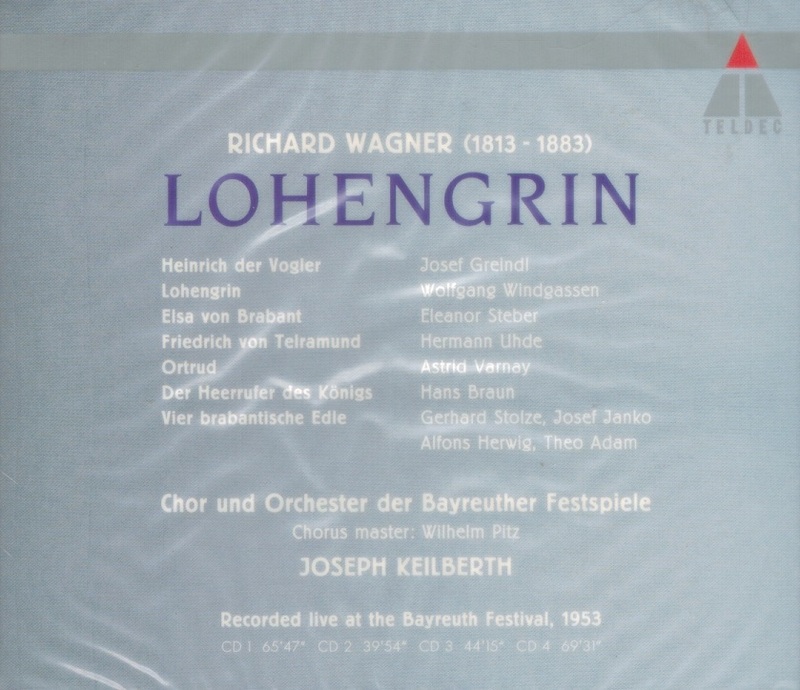 It has long been regarded as one of the best recordings of the opera….Windgassen was an ideal Lohengrin, youthful, not too heroic, vocally steady and texturally astute. Steber is also ideal, her Elsa beautifully sung with a voice of silver clarity….Here [Varnay’s] Ortrud emerges as the truly fiendish character Ortrud really is….The Bayreuth chorus, as usual, is a pillar of strength." 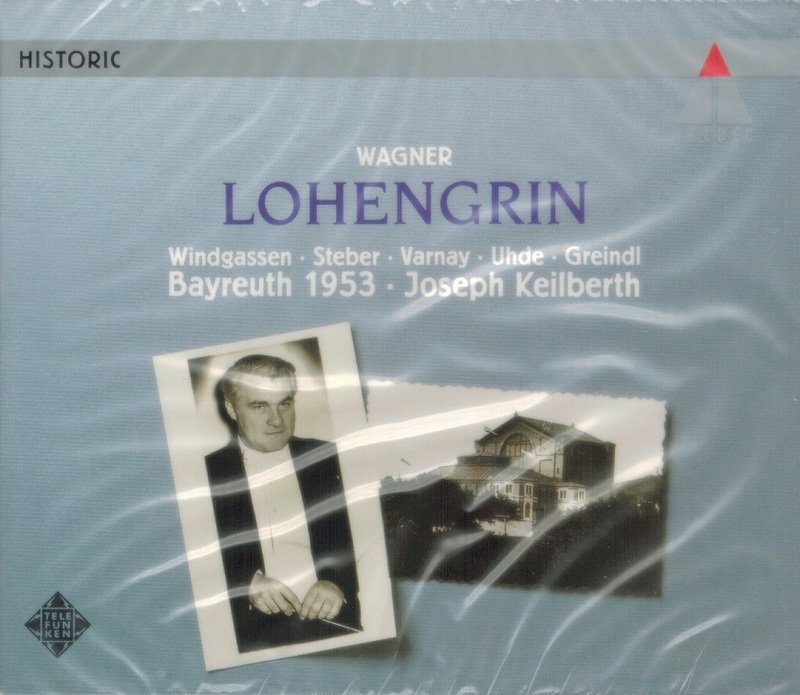 “The most important singer of the German Heldentenor repertory in the 1950s and 1960s, Wolfgang Windgassen employed his not-quite-heroic instrument, believable physique, and considerable musical intelligence to forge memorable performances on-stage and in the recording studio. "…the great surprise is the Elsa of Eleanor Steber – alas, a singer now almost forgotten. She had absolutely everything needed for the role and then some: a voice of great power and beauty under perfect control, an ability to follow and illuminate every nuance of the text, and intonation that would put Heifetz to shame….while Steber is singing, there seems to be perfection everywhere." "Ortrud…sung by Astrid Varnay…was phenomenal. She had the ability to express in both her voice and acting every emotion from the fawning submission to the raging fury of Ortrud. In my opinion, her interpretation has not been equaled by anyone else." "The dramatic soprano Astrid Varnay was born into an operatic family: her mother was a coloratura soprano and her father a spinto tenor. The year in which she was born they founded the Opera Comique Theatre in Kristiania, Sweden, although they were both born in Hungary, and they managed it until 1921.The family then moved to Argentina and later to New York, where her father died in 1924. Her mother subsequently remarried another tenor, and the young Astrid, after studying to be a pianist, decided at the age of eighteen to become a singer. She worked intensively, first with her mother and then with the Metropolitan Opera conductor and coach Hermann Weigert, whom she later married. She made her sensational stage début at the Metropolitan in 1941, substituting at short notice for Lotte Lehmann as Sieglinde in DIE WALKÜRE with no rehearsal. After this triumph, six days later she replaced Helen Traubel in the same opera as Brünnhilde, and her operatic career was effectively launched. She made her Covent Garden début in 1948 and, at the suggestion of Kirsten Flagstad, her Bayreuth Festival début in 1951. She sang every year at Bayreuth for the next seventeen years and at the Met until 1956, when she left following a disagreement with Rudolf Bing. She henceforth concentrated her career on Germany where she was revered, living in Munich. She moved from the dramatic soprano repertoire into that for mezzo-soprano in 1969, and during the 1980s into character parts. She made her last appearance in Munich in 1995, almost fifty-five years after her Metropolitan début. Her brilliant career is well documented in both commercial and unofficial sound recordings." He remained there until 1940, when he was appointed chief conductor of the German Philharmonic Orchestra of Prague. He became chief conductor of the Dresden State Opera in 1945. With a minimum of disruption for deNazification he remained in that position until 1950. In 1949 he became chief conductor of the Bamberg Symphony Orchestra, which was in fact a reunion. After the War, the German population of the Sudetenland (the German-speaking part of Czechoslovakia), which had been the excuse for Hitler's occupation of the country, were returned to Germany, and with them went the German Philharmonic of Prague, Keilberth's old orchestra, which settled in Bamberg. Causing unwary biographers some confusion, he also became the chief conductor of the Hamburg Philharmonic in 1950. He frequently appeared as a guest conductor elsewhere in Germany, notably with the Berlin Philharmonic and, beginning in 1952, the Bayreuth Festival, and appeared regularly at the Salzburg and Lucerne festivals. In 1952 he also led his first performance in the Edinburgh Festival with the Hamburg State Opera. He was a favored conductor for the RING and other operas through 1956. In 1959 he succeeded Ferenc Fricay at the helm of the Bavarian State Opera in Munich. There, history repeated itself. Keilberth died after collapsing during a performance of Wagner's TRISTAN UND ISOLDE, just as Felix Mottl—conductor at the same theater - had done in 1911.